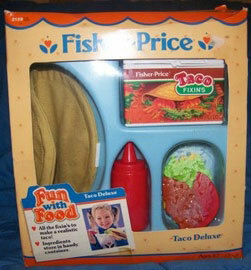 Description: This 7-piece Fun with Food taco set comes with enough pieces to make a realistic taco. The exclusive fabric taco shell used in this set has a wire inside that makes the taco shell stay closed over the fixings inside. Designed for children ages 3 to 7 years old. 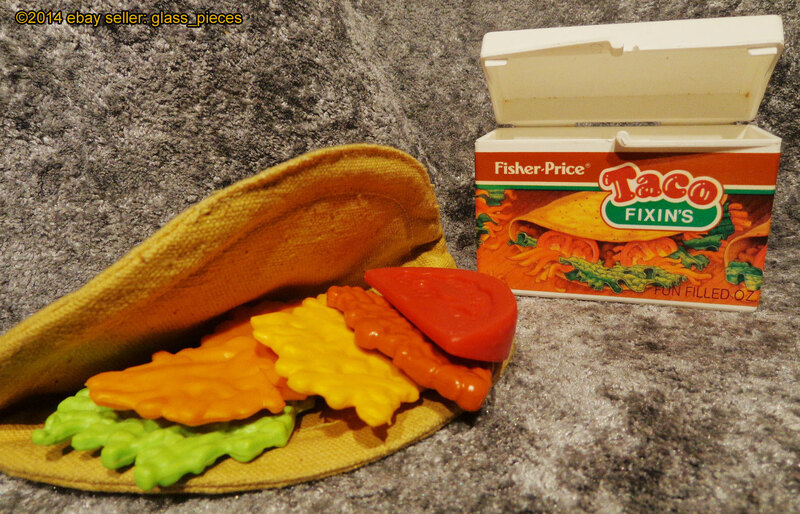 FPT7251 - Tan cloth taco shell that folds closed like a real taco. The shell is made of burlap-type material, and it has a wire inside that helps the shell stay opened in a circle, or folded in half. FPT7252 - Green molded plastic shredded lettuce serving. The mold is flat with long rectangular shredded lettuce pieces molded together. FPT7188 - Red tomato wedge with imprints of tomato seeds on both sides of the cut wedge. FPT7253 - Yellow molded shredded cheese mound (American Cheese). The mold is flat with long rectangular shredded cheese pieces molded together. FPT7254 - Brown molded refried beans serving. The mold is flat with small round beans molded together. FPT7256 - White rectangular container with a litho on the front marked "Taco Fixins" in brown, green, and white. The top of the litho has a brown bar with "Fisher-Price" in white. The litho also has a picture of a taco. The container has an attached rectangular flip-up lid with a "Fisher-Price" imprint on top. FPT7255 - Tall round squeezable red ketchup bottle with a round cone-shaped pour tip on the top. FPT7257 - Sold in a 8-7/8" long, 9-7/8" high, 2-7/8"deep display box. 1988 - Also sold in #2124 Fast Food Assortment. 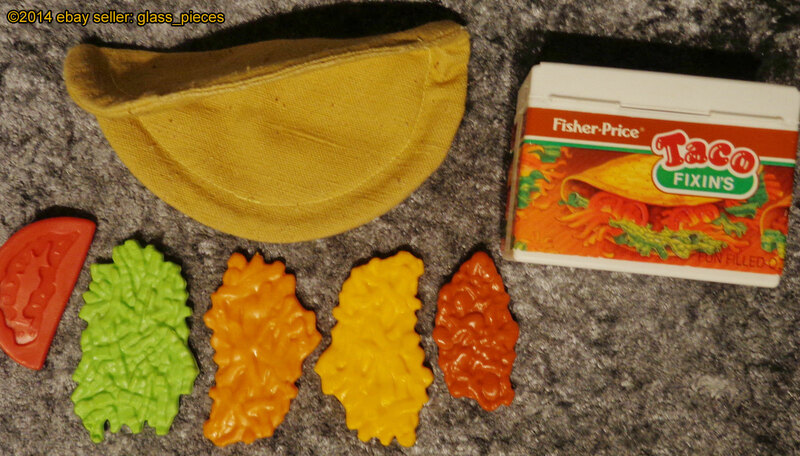 1989 - Also sold in #2125 Play Food Assortment.